The bulk of the Wild’s success during its five-game win streak has come on home ice and with the team surrendering the first goal of the game. 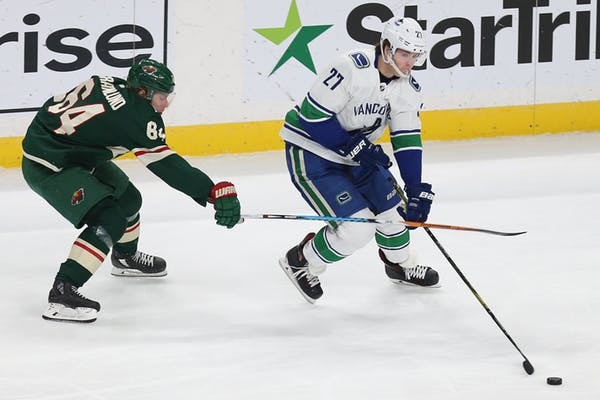 But in coach Bruce Boudreau’s mind, the latter will have to change to extend the run – and the former will, too, since the Wild begins a stretch of seven straight road games Monday in Vancouver against the Canucks. Opponents have scored the first goal against the Wild in seven of the team’s last eight matchups; the Wild has struck first just three times this season. Still, it’s persevered to go 5-1-1 when giving up the first tally. But as the road team, building a lead will be key; same with other details, Boudreau mentioned, like cutting back on penalties and assembling a strong first period. Goalie Devan Dubnyk is slated to start against the Canucks, but that doesn’t mean backup Alex Stalock will appear Tuesday in Edmonton vs. the Oilers. 1-2: The Wild’s road record. 398: Career goals for center Eric Staal. 17: Penalty kills by the Wild in its last 18 shorthanded situations. 2: Game-winning goals for defenseman Jonas Brodin in the last two games. 9: Points for winger Mikael Granlund during a seven-game point streak. Vancouver has struggled in recent games, getting outscored 9-1 in its last two losses. Overall, the team is 6-6 – an encouraging start for a team that’s rebuilding. Another bright spot has been the emergence of rookie Elias Pettersson, who has five goals and eight points in six games. Burnsville native Brock Boeser has two goals and six points in 10 games. Between the pipes, goalie Jacob Markstrom is 3-3 with a .902 save percentage and 3.27 goals-against average.